Pronounced BAZ-MAH-TEE, basmati is a type of rice grown in the Himalayas, India, and Pakistan, with India producing about two-thirds of the world's supply. It is a long grain rice that is characterized by a light nutty flavor and floral aroma and it's popular in rice pilaf and curry recipes. Rice, in general, is classified by size into three groups — long grain, medium grain and short grain. Basmati is a long, skinny rice and shares the long grain group with jasmine and American long grain. Medium grains, such as arborio, are great for paella and risotto. Short grains produce a stickier cooked result so they are great for use as sushi rice. 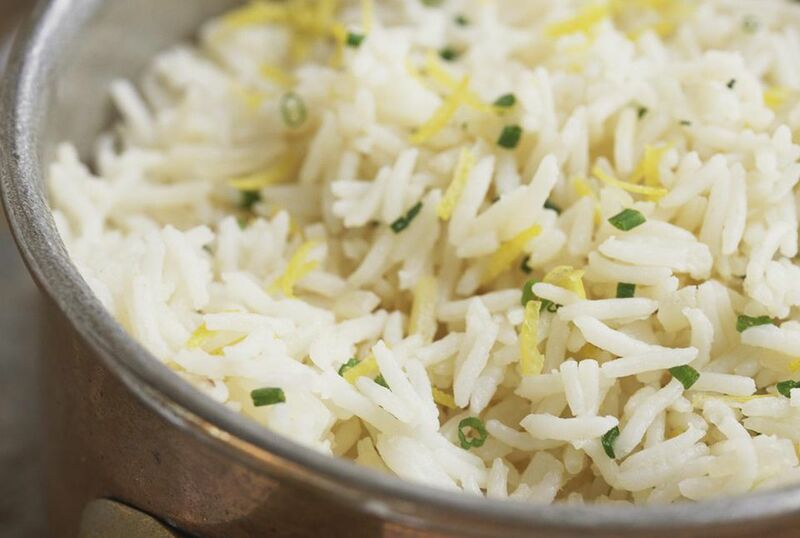 Basmati is remarkably long for a rice and becomes longer still when cooked. It retains its individual non-sticky grains which allow sauces to coat well. It can be either brown or white with the brown variety having a deeper flavor. When cooked, the rice is lighter and more fluffy than standard white rice and does not stick together. Basmati grains should be slightly tapered on the ends of the grain and never flat. The color should have a slightly golden hue instead of pearl white but it should not be gray. Good quality basmati is sometimes aged for a few years which helps dry the rice to allow the grains to remain separate even after cooking. Basmati rice may be found in the gourmet section of your supermarket, at specialty stores or at a Middle Eastern grocer. However, most large American supermarkets will carry a couple of variations, usually packaged by large and well-known rice companies. One common find is called Texmati and is probably one of the most recognized brands of rice in the U.S. It's a form of white rice that combines the aromatic, fragrance and cooking qualities of traditional basmati with American long grain. The other frequent supermarket find is called Jasmati. This rice is bred to have the softness of cooked basmati and the nutty aroma of jasmine rice. To what degree Jasmati relies on the traits of the two parent rices is a subject of some legal dispute. But consumers should be aware that Jasmati is neither fully jasmine nor fully basmati when making their purchasing decisions. When it comes to cooking pure basmati rice, though, pilaf is the way to go! So, what exactly is it? Put simply, pilaf is a dish that contains rice cooked in a seasoned broth such as chicken stock, beef stock or even vegetable stock. From that base come many variations, the most common of which are to first saute onions and other vegetables in oil before adding the rice. The rice is then fried for a few minutes until all the grains are coated in the oil as well. Then the stock is added. In addition, pilaf dishes often contain nuts and or dried fruit such as raisins or cranberries added after cooking. Pilafs probably originated in India but quickly spread and are now common in many parts of the world and all over the countries of the Middle East. Try a few of these variations with your basmati rice.